President Nixon strategizes with his Chief of Staff, H.R. Haldeman, in the Oval Office. Throughout his life, Richard Nixon displayed a tremendous mental fortitude in all that he endeavored. He carried on over this discipline as President of the United States, often spending hours jotting down ideas and strategies on yellow notepads, pondering the options before each and every decision was made. RN set a high bar of excellence and critical thinking for himself, and it served as inspiration for all on the White House staff to likewise put out their best work on a daily basis. Such excellence was displayed shortly after the mid-term elections of 1970. Following an unimpressive performance by the Republican Party during that election season, President Nixon drafted a comprehensive strategy memo for his chief of staff, Bob Haldeman. The 30-page memo advanced a compendium of analyses and recommendations on methods to improve his administration’s posture for the latter two years of his first term. The presidency had been hampered by an air of negativity brought on by decisions regarding Vietnam. Yet, the Nixon administration weathered the storm of demonstrations and negative media campaigns and decisively shifted popular support in their favor. Referencing the memos his staff had written him on the subject of post-election strategy, RN picked out what he thought most needed attention, namely the fine-tuning of his administration’s media savvy and public relations discipline. -Never have a speechwriter handle television production. -In the age of television, technical quality is probably more important than the content of what is said. On this basis, President Nixon wanted a full-time television man on the White House staff. -He wanted to better inform the press regarding presidential trips, particularly trips to his residences in California and Florida. He believed that staff needed to do a better job of getting the President’s schedule, in terms of work prospects, to the press so as to avoid needless bad press. -He wanted the White House staff to better reflect an upbeat attitude when discussing initiatives of the administration. He urged that staff members cannot be influenced by the downbeat attitude brought on by the Washington press corps and Washington chit-chat. 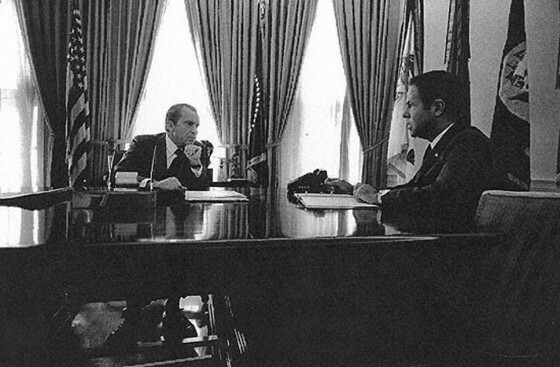 President Nixon allotted the remainder of his memo (which happened to be the greater part of his memo) on analyses of his staff’s recommendations, and advised Haldeman on which recommendations to implement. Truly emblematic of the weight with which President Nixon regarded his staff’s opinions, it would appear he spent hours reading every memoranda word for word. The list of thinkers contributing to RN’s political goals for the years 1971 and 1972 were abound: John Ehrlichman, Donald Rumsfeld, Ron Zieglar, Pat Buchanan, Herb Klein, Bryce Harlow, Bill Safire, Harry Dent, Lyn Nofziger, Tom Houston, Chuck Colson, Murray Chotiner, Jim Keogh, Len Garment, and William Timmons—all men of great intellectual capacity and imaginative ideas when it came to devising methods to catapult President Nixon and the nation to success. Many of the memos covered the following topics: they shared similar sentiments on how Vice President Agnew should be used; all offered recommendations on Presidential travel and a better working relationship with Congress. They also emphasized the positives which had dodged the media’s attention: respect for the Office of the Presidency has been restored at home and abroad, a development none imagined possible in January of 1969. Consensus held that the White House staff would have to do a better job of selling what the administration had been able to accomplish up to that time and that the president should remain, for the most part, presidential and not political through 1971 and most of 1972–that would be his ultimate strength. President Nixon intended for this memorandum to repair a damaged ship that had just come out of the fog of its first battle. As captain of this ship, RN identified the time prime to consolidate his resources and reassure his men. In a time of uncertainty he established his line of thought on some key decisions and directed his staff to implement those decisions as he saw fit.